To help international corporations, organizations and governments improve the quality of life of their respective population through innovative, culturally appropriate, and cost-effective health promotion programs. By providing flexible and strategic solutions Wolf Kirsten International Health Consulting will help meet the major challenges international companies face with the adoption of global delivery strategies and policies. The unique competitive advantage of Wolf Kirsten International Health Consulting is its extensive international network of health promotion experts. Wolf Kirsten is extremely well-connected internationally and with 20 years of experience working and living in Germany, the United States, England, China and Brazil, he can help you meet the global challenges. Health promotion and well-being have become an important business factor for multi-national corporations. Innovative human capital management strategies feature integrated health promotion and wellness programs in order to keep a diverse and aging workforce healthy and productive. "Global Perspectives in Workplace Health Promotion" highlights how 21 key countries are addressing the chronic disease challenge by focusing on the following areas regarding workplace health promotion. 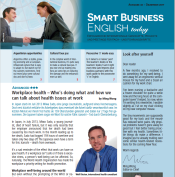 Interview with Wolf Kirsten on Workplace Wellbeing Around the World in Smart Business English today. 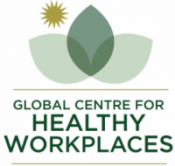 The Global Centre for Healthy Workplaces supports the advancement of workplace health and well-being. Formed in 2014 out of a successful partnership between i-genius and International Health Consulting, the Global Centre runs the Global Healthy Workplace Awards – with Summits in London (2013), Shanghai (2014), Florianopolis, Brazil (2015), Washington, DC (2016), Singapore (2017) and in Bergamo, Italy in 2018.